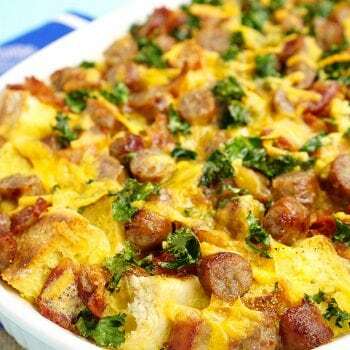 Lightly grease a 1.5-quart baking dish and layer the dish with English muffin pieces, bacon, sausage, cheese, and kale. In a medium-sized bowl, whisk together eggs, milk, Vital Proteins Collagen Peptides, salt, and pepper. Pour the egg mixture over the English muffin mix in the baking pan. Cover with foil and allow to sit for 20 minutes or refrigerate immediately for baking in the morning. Bake covered for 25 minutes. Uncover and bake for an additional 15-20 minutes until the eggs have firmly set and the top is very lightly golden.